Ok, so you have a profile – you’ve claimed your name. But are you active? And if you’re active, are you active for yourself, or on behalf of your clients? 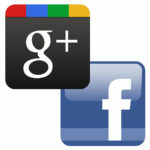 Because if you’re only on Google+ for the SEO benefit, you are missing a huge opportunity. True that G+ is more of an “identity” platform than a social network. True that reviews, the number of people who have you in circles and authorship snippets are shown in SERPs. But you may not realize the power that Google is soon to have over Facebook, and why eventually, Google will push Facebook aside in their quest for our information. Facebook was outed last week as studies showed that they have reduced the reach of brand pages (and by extension, non profits, bands, and locally owned shops) even more. You see, Facebook has reached that critical mass that Google reached back in the early 2000s, where they realize that they need to monetize all this traffic. They’ve been offering ad placement for a while, but the mindset of a Facebooker is just not the right one for brands to reach with a display ad. So they started throttling brand reach, showing page updates to only a small portion of the followers that page had. They offered “sponsored stories” as a way to ensure that your updates would show for a larger set of your followers. But then they turned down the dial even more. Now, if you create a page for your brand, all those followers and likes you work so hard to get won’t mean anything unless you use sponsored stories. In fact, your updates will only be shown to about 1% of them. That means if you are a local coffee shop (like my favorite, Sola, here in Raleigh), I can “like” your page, but I still won’t see the update every week about what band is playing Saturday night unless you pay Facebook. Should I Even Create a Facebook Page? You can see that I’ve weighed in by saying he should just use G+. The conversation was run of the mill for my network (a group of passionate marketers), but the way it encapsulated the central conflict between Google and Facebook for brands was just too good to pass up. Ben is a great guy. 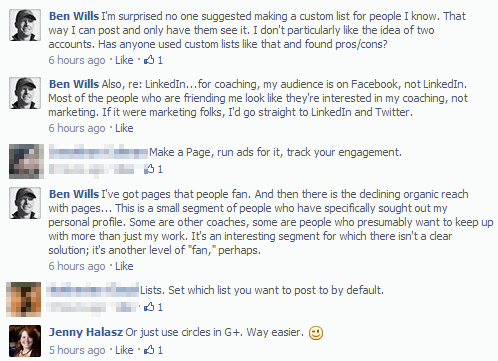 He’s got a ton of social media connections from his former life as an SEO, and he doesn’t need (or probably want) the pressure of paying for “promoted posts”. But he is going to have people who follow him simply because they want to know where his next workshop is going to be. Many Facebook users still don’t realize that their conversations, their personal reach, even who Facebook prompts to send Candy Crush lives to… is controlled. Facebook is using an algorithm to determine what you should and shouldn’t see, and that post about how funny that thing your kid said is only being shown to the friends that are likely to “like” it. There’s nothing wrong with controlling conversations, it’s just that the person who created the account ought to be able to do it. This is Facebook’s other attempt to monetize, and it’s inherently flawed. Google is already monetized. Sponsored ads, shopping search, Enterprise Google Apps, Enterprise Analytics. They don’t need to monetize social. They probably will at some point, but for now, they don’t need to. And for that reason, they’re able to provide an experience with Google circles and Google Pages that you can control as the publisher and as the user. Don’t want to see posts from a particular page or user? Mute them. Want to see more from your favorite coffee shop? Put it in a special circle. The interface is simple and elegant. The main benefit to brands today for Facebook is the expansive reach. Everyone and their mother (literally, my mother’s on it) is on Facebook. But if Facebook keeps limiting the reach that they sold brands on in the first place, brands are going to start to go elsewhere. And if brands go elsewhere, eventually the users will follow them. Add to that the problem of “likes” and “follows”. I saw a great keynote at Pubcon New Orleans last week by Peter Shankman, where he predicted that within 24 months, likes and follows will be a thing of the past. He said (and I think he’s right) that we won’t need to “like” or “follow” our local coffee shop anymore. Instead, our phones (Google/Apple) will notice when we visit the same place 3 times a week and automatically add it to our feed. They’ll see that we like the food and prompt us for a 5 star rating. We won’t even need to friend our friends because it will be obvious we are in the same place a lot, we’ll be tagged in photos together. I’m not sure it will happen in 24 months, but it will happen. And Google, with its unprecedented access to our location, emails, apps, and everything else, will be able to lead the charge. As soon as it becomes that seamless, people will flock to Google and leave Facebook to the dust that claimed MySpace and Friendster. The brands will be there waiting for us.